Baylor forward Taurean Prince (35) scores between Savannah State guard Keierre Richards, right and Joshua Montgomery during the first half of an NCAA college basketball game, Friday, Jan. 3, 2014, in Waco, Texas. Taurean Prince thinks he’s starting to better understand his role with Baylor. The results back him up. For the second consecutive game Prince came off the bench to provide a spark for the ninth-ranked Bears, scoring 12 of his 15 points in the first half of an 80-50 win over Savannah State. Cory Jefferson had 13 points for Baylor (12-1), and Isaiah Austin and Rico Gathers each scored 11 as Baylor won its 12th consecutive home game. "It’s just a learning process, and I’m just trying to find where I fit and try to be the best at what I do," said Prince, a sophomore. In his freshman year, he played in 24 games, and didn’t start any of those either. He has played in all 12 of the Bears’ games this season without making a start. 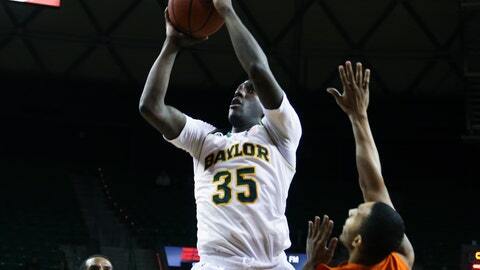 On Monday, Prince came off the bench and scored 16 in Baylor’s 81-55 win over Oral Roberts. And not being in the starting lineup isn’t a concern of his. "I think our coaching staff never doubts (Prince’s) offense," Baylor coach Scott Drew said. "We’re always encouraging him about the other end, and he’s gotten better and better. Because of his length and athleticism, he can be an impact defensive player as well as an offensive player. So, really pleased with the progress he’s made there." Joshua Montgomery made four 3-pointers and scored 14 of his 15 points in the first half for Savannah State (2-12). Baylor improved to 25-9 in January since 2009-10. The Bears’ only loss this season was to then No. 8 Syracuse in Hawaii in November. Jefferson hit a 3 — his second of the game and fourth of the season — to give Baylor a 45-28 lead with 1:41 left in the first half, and the Bears led 46-30 at the break. Baylor was 6 of 8 on its 3-point attempts in the half, and shot 75 percent from the field. "It was a combination of things," Jefferson said of the shooting percentage. "Good ball movement and knowing where our guys are going to be by knowing the plays and paying attention during practices." Baylor had 19 assists for the game, 12 in the first half. "We really shared the ball in the first half, made the extra passes and we made shots," Drew said. "Second half, we didn’t get as easy a looks, and didn’t work the ball early on. And then, we had some 3s, and we were 1 for 11 in the second half from 3." Both teams struggled after halftime. Baylor scored just five points in the first 5 minutes. Savannah State was scoreless until Jeremiah Hill’s jumper in the lane with 14:12 left. At that point, Baylor held a 51-32 lead. Gathers made four consecutive baskets for the Bears in a 3-minute, 21-second span midway through the second half. He hit a layup with 13:01 left. On Baylor’s next possession, he established his position just under the basket on an inbounds play, took the pass from Ish Wainwright and slammed in a quick dunk. After a rebound and putback, Gathers then converted a three-point play that gave Baylor a 62-42 lead with 9:39 remaining. Jyles Smith shot Savannah State’s first free throw with 6:52 left in the game, making 1 of 2 after being fouled by Jefferson. For the game, Savannah State made 2 of 4 free throw attempts. Baylor was 19 of 28 from the line, with Prince making six of his eight attempts. "You expect that type of unbalance," Savannah State coach Horace Broadnax said. "We weren’t doing what we needed to do to attack the basket off the dribble like I wanted to. Going up against these trees, it’s hard for these 6-foot guys to get the ball to the basket." Baylor opens Big 12 play at Iowa State on Tuesday.